Features One-of-a-kind denim patchwork made from salvaged vintage jeans Adjustable & versatile strap to wear on the shoulder or cross-body Zipper pocket for phone / wallet One Size fits most (see sizing further down) Drawstring tie closure with tassels Fully lined interior Made with an industrial grade sewing machine for durable seams & quality finishes Materials Exterior: salvaged vintage denim patchwork (made from various vintage jeans) Interior: poly/cotton breathable blend Antique brass hardware accents throughout bag Premium strength polyester string used in stitches for long-term durability Size This yoga bag is made to fit most mats on the market. It best fits standard-Size d mats with the dimensions of 24 inches x 5.5 inches diameter (rolled up) or smaller. 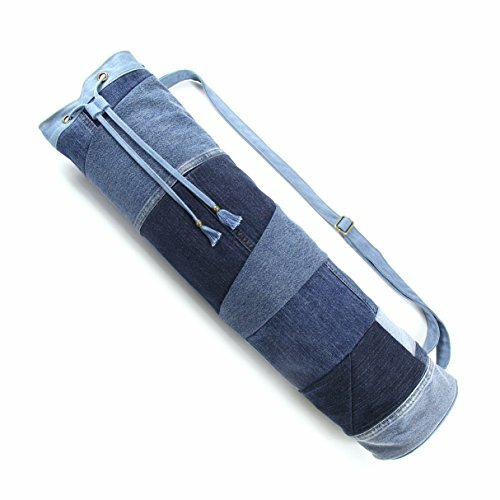 Wider mats will still fit but may peek out of the top of the drawstring bag.